A couple of years back, Rebekah Higgs signed with Hidden Pony and released an album, but she since seems to have gone the DIY route for a new EP called Sha La La. This isn't really a cohesive EP, since a description on Bandcamp refers to it as "a compilation of 6 songs chosen from my recent music recordings." The songs were variously recorded with Joel Waddle in Dartmouth, NS, with Geoffrey Pye in Wakefield, QC, and — in the case of "Dream" — with the built-in microphone on Higgs' computer. "Pills" was written by Jay Holy, who Higgs describes as her "loving baby daddy." 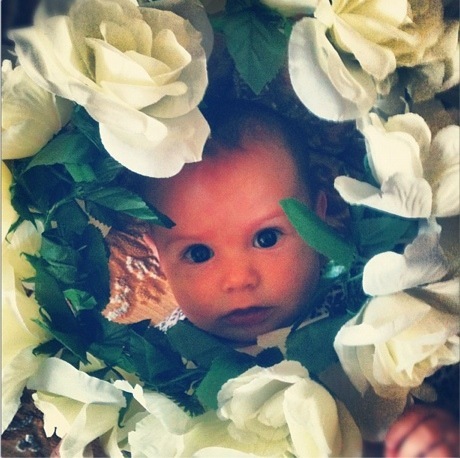 We're guessing that said baby is the little one featured on the album cover. Hear the vintage-flavoured dream-pop collection below. It officially arrives tomorrow (November 5), but it's available right now as a pay-what-you-want download below.